I suppose it is traditional to write a Christmas letter and enclose it with my Christmas cards. I have failed to do that for the last several years. It feels presumptuous to me, I guess. I don’t really know. Maybe in the age of Facebook, I don’t feel like the Christmas update is as necessary. There is some value in introspection though, so I’ll give it a shot. Brady again, asking you to support the Domestic Auto Industry. It appears that an agreement has been reached to provide about $15B of loans to GM and Chrysler so that they can last until March. During that time, they are to negotiate with creditors, labor unions, shareholders, and other stakeholders to bring themselves into a reasonable cost structure. Some are calling it “Bankruptcy Lite”. A “Car Czar,” appointed by the president, would monitor progress and ensure that taxpayer dollars would be well spent. Additionally, the government would benefit on the upside with stock positions in the companies. This plan seems reasonable and will protect the taxpayers. However, even though there is reportedly agreement between the House of Representative and the White House, Republican Senators are threatening to block passage of this bill. If the automobile companies are allowed to fail, hundreds of thousands of people will lose their jobs. You know at least one of them. Hundreds of thousands of senior citizens may lose benefits from their pension plans. You probably know at least one of them too. There has been lots of talk lately about Energy Independence, the concept that we rely too much on foreign countries for oil and other energy. If we allow the largest domestic manufacturing industry to fail, we could find ourselves in a similar situation, relying on foreign countries for cars and other heavy manufacturing. Do we really want to go there? Save American Jobs. Heck, Save Brady’s Job. And don’t forget the Ford Story! As you probably know, I work for Ford, which is facing a crisis of its own caused in good part by the on-going credit crisis. We have been aggressively restructuring our business and re-inventing ourselves. The crisis we now face is not of our doing. Because of the uncertainties in the economy at large and the scarcity of credit, people have quite literally stopped buying cars. Ford has positioned itself to be profitable at lower volumes than in the past, just not this low. I have struggled with my own ideologies, saying that “Too big to fail is too big to play.” At the time, my job wasn’t at risk. I still believe that it is true. However, somehow the US automotive industry got to a point where we are too big to fail. The failure of one of the Big 3 auto companies would likely drive many of its suppliers into bankruptcy as well. Because the supply base is so intertwined between all of the major players (including the foreign automakers), wholesale disruption in the supply network would likely cause the failure of the domestics and a suspension of domestic production by the foreign automakers. I believe from everything that I’ve read and heard that Ford is well positioned to survive a short economic downturn. However, if GM were to fail, the economic fallout would likely also drive us into bankruptcy. Melanie asked me if the bailout is good or bad. I don’t know. I do know that it is neccessary. I don’t advocate a free ride for anyone. There should be pain for all involved, as we all got into this together. The union, the executives, the employees, the shareholders, and the taxpayers. · Ford’s product-led plan to deliver more of the safe, affordable, high-quality and fuel-efficient vehicles that consumers want and value remains solidly in place. We are also well-positioned to take advantage of our global scale and strengths. · Ford has committed to leading in the development of advanced technologies, including EcoBoost, Flexible-fuel vehicles, clean diesel, hybrids, plug-in hybrids, and hydrogen cars. · Ford alone has invested more than $22 billion in research and development (2005-07). 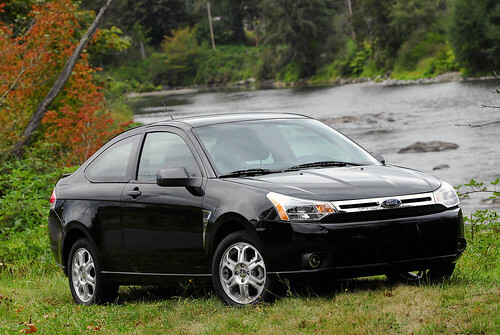 · Ford’s quality is now on par with Honda and Toyota and rising every year. · The new Ford Fusion Hybrid beats the Toyota Camry Hybrid in fuel mileage. Please take a few minutes to act. There are links below with contact information for your Senators and Representative. Please call them or email them. Tell them that the failure of the auto industry should not be an option. Give us the time that we need to finish restructuring without the added pressures of the credit crisis and economic downturn. Please feel free to send these links to your family and friends and ask them to take action to support our industry and our economy.